The LINAX DR2000 videographic recorder is the simple solution to record data manipulation-proof. With its up to 12 universal analog inputs and various visualization modes, such as curves, waterfall and bar graph, it is universally usable in many applications. With its additional 6 digital inputs other values can be recorded, operating times and switch states of additionally connected devices or time synchronization. The recorded measurements are additionally stored on a 128 megabyte internal memory and optionally on a SD card. By using modern interfaces such as Ethernet and various communication possibilities such as Modbus TCP/RTU slave, data can be automatically transmitted to primary systems. Through this a simple system connection is possible. Up to 30 limit values can be freely assigned to the channels. Limit value infringements are displayed and stored in the device. Furthermore 6 internal relays can be used for alarm transmission. 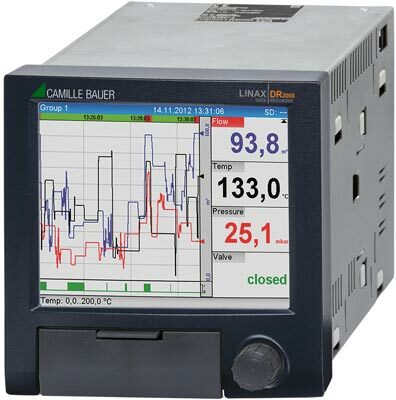 The flxibility of the LINAX DR2000 is increased through the optional 4 mathematics channels. The device can make individual calculations which can be simply entered using a formula editor.